I apologize to anyone who has been visiting Noah’s blog looking for an update. It’s hard enough finding the time to post regular updates and maintaining them across two different sites / blogs. For now, please subscribe to Noah’s campaign on his GoFundMe site for updates and notifications. You do NOT need to donate in order to see updates and get notifications. First I wanted to take a moment to say THANK YOU for the incredible support we’ve received so far. I cannot find the words to express our gratitude for everyone’s generosity, both in donations along with well wishes, prayer and an outpouring of support asking if we need help with anything else. Also, a big thank you to those who have shared Noah’s GoFundMe campaign! Noah had surgery on Monday along with several other procedures to kick-off his treatment and he has been recovering most of the week. 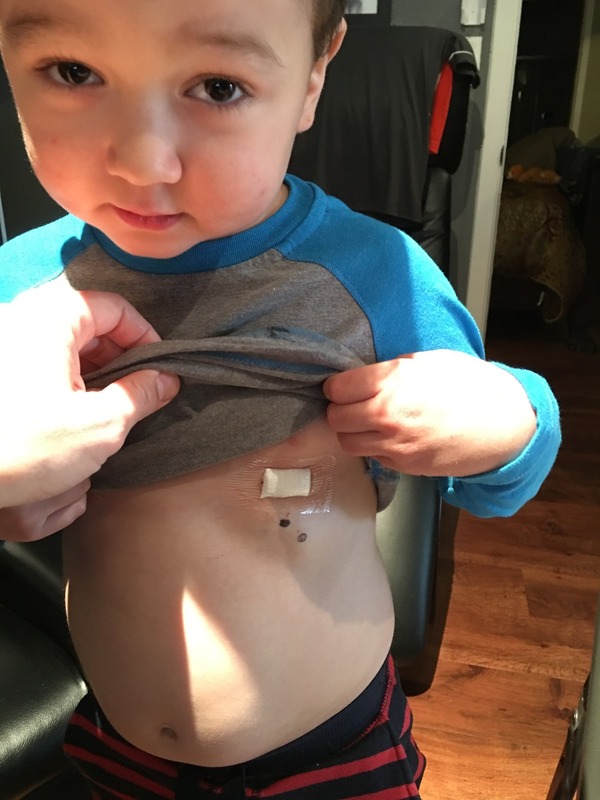 First he needed to have his port (port-a-cath) replaced since his old one could not draw blood. It was his third port and his doctor decided against replacing it so late in the process since we had planned to take it out soon. He also had to switch back to a double port, meaning they can hook him up to two IV lines at the same time. Unfortunately since he has had 3 ports and catheters previously, this led to significant scar tissue build up in the pulmonary vein they had been using, so they had to move the catheter to his ride side pulmonary vein (that’s what the incision on his neck was for). The surgeon who replaced the port told us the vein they had been using is pretty much dead/not working which is a bit scary, but apparently not uncommon. The body will apparently form smaller vessels around the scar tissue and get that blood to the heart by other means. In addition to the port replacement they performed an LP (spinal tap) to check his spinal fluid again and begin his IT (intrathecal) treatment. That is chemo injected directly into the spinal column. They also performed a bone marrow biopsy to check if there is any leukemic activity in his marrow which could lead to a transplant if positive. This would just be further complications so let’s hope that comes back clear. This week Noah will also begin his 3 times per week regiment of IV chemo in addition to the treatment in his spine. He’s going strong so far, just getting over the pain of surgery, but still in good spirits. I’ll post another update by this weekend hopefully with the results of the marrow biopsy and any other news. We are very sad to share the news we received this week. After Noah was sick for the past few weeks with what we thought was a viral infection, it has been confirmed that his leukemia has returned. He is relapsing. Right now we know that the leukemia has returned in his central nervous system so it’s in his spinal fluid and the lining of his brain. This is particularly unfortunate as treatment will have to be focused in these areas along with the rest of his body and will include radiation therapy of his spinal column/brain (chance for severe side effects). Noah’s entire treatment, since the day he was diagnosed just before his first birthday (~3.5 years ago) will have to start over completely. Another 3+ years starts next week. This time the treatment will be harsher and more dangerous all around and the prognosis gets worse with relapse. Needless to say this is a shock to us all. More than anything we feel for Noah who was in the home stretch of his initial treatment. He just returned to school earlier this year, was able to be in more activities, was 1-2 months from completing his therapy and was incredibly exciting about going to Kindergarten next year. We have faith in his treatment and his doctor, but Noah will need your positive thoughts or prayers more than ever now. We’ll get him through this. First thing Monday morning his treatment will begin. 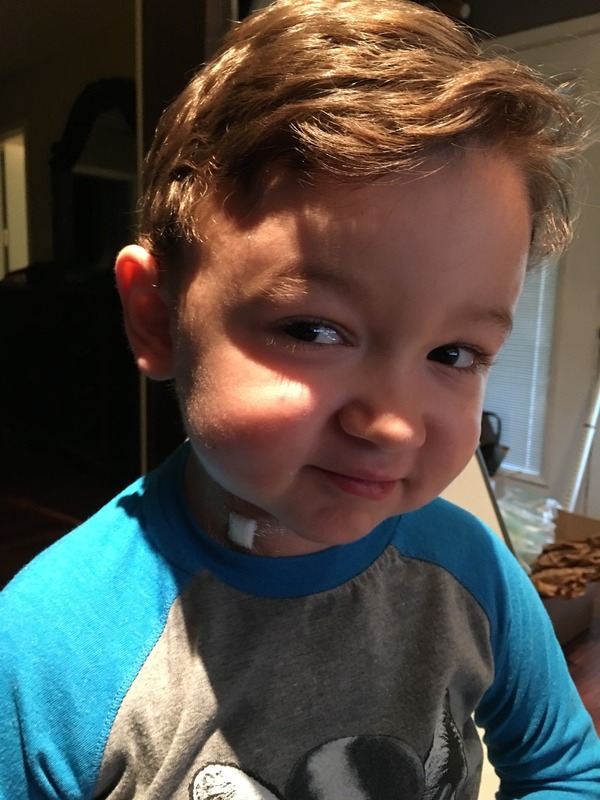 He’ll have his current port-a-cath replaced (surgery) as well as a bone marrow biopsy performed. We hope that there is no relapse in his marrow which would require a transplant. I’ll be posting updates here and on his former blog (www.noahkeck.com). These next few days we’ll be making sure he gets to do everything he has wanted to do since the next few years will be very limiting and a tough road. Thank you for all the encouragement, thoughts, prayers and other comments we’ve received so far. We really appreciate everything! Noah has fought too hard to lose this fight now. We won’t let that happen. We’re excited to let everyone know that Noah is continuing to do well with his treatments over the past several months and he is now well into his final year of treatment. He still has his good days and bad days with his various medications, but overall his counts are holding steady and all his routine tests (spinal taps, bone marrow biopsy, etc) are coming back clear. It’s pretty much a matter of managing through the side effects. He did end up receiving four IVIG infusion treatments earlier this year. This is the treatment I mentioned that he received back in October for the first time. It helps boost someones immune system against certain types of infections. The temporary side effects can be pretty bad, but short-lived. Two of the treatments went well, one gave him some trouble and one of them made him really sick and we ended up in the hospital. It’s always hard to watch when there are known and common side effects that will make you feel extremely bad, but the protection to the immune system is worth it. There were a lot of bugs going around this Winter and he was able to stay safe from those which is most important. The last thing I’ll mention is some great news we got the other week. Noah’s doctor gave us the thumbs up for Noah to go back to school, at least part-time. We can’t wait for him to get some time with other kids and an outside environment on a semi-regular basis. He loves playing with other kids but never gets enough time. This should help him socialize a bit more before he starts school in the near-future. Time is flying! You may notice that we launched a new fundraiser through GiveForward (look to the right in the sidebar). We really appreciate all donations and every penny goes towards chipping away at the cost of Noah’s current and past treatments. Please do not feel obligated to donate. I’ll be posting some updated pictures and videos soon as well. Last month my parents and several close family friends spent the better part of a week planning and then working a yard/garage sale to benefit Noah. There was a lot of effort involved to get everything together and ready as most of the items were rather large furniture or antique pieces and then 3 full days to sell everything. In total they raised over $2,500 to help go towards Noah’s continued medical expenses and we are extremely thankful. This was a huge surprise for us and makes a world of difference. I didn’t realize it has been so long since the last update, sorry everyone! The past few months have flown by and a lot has been going on with Noah, but I’m happy to report that as of right now he is doing quite well and still on track. Noah still goes to the clinic about once or twice a week and is still on constant chemotherapy and steroid treatments, but he is used to it. As usual the chemo doesn’t seem to affect him very much, luckily, but the steroids still do unfortunately. For the longest time we had to keep Noah fairly isolated as many of you know but we’ve started getting him out more and more as his immune system has grown stronger. This summer however Noah caught a pretty severe waterborne virus and we still don’t know exactly how. Probably from touching a water source outside somewhere and putting a hand in his mouth. Just that quick he got extremely sick and ran a dangerously high fever for several days (even more dangerous for leukemia patients), but we were able to get it under control after about a week. This sent his treatment off-track though for about 6 weeks or so, which is risky. We had to stop all of his chemo due to very low counts. He did however stay on his steroids. Things finally got back to normal of course. We still take him out but we just have to keep an extra eye on the little things. About a month ago Noah’s doctors suggested a treatment which he didn’t get last year, due to the more intense treatment he was on. They asked for us to give Noah an IVIG infusion which helps protect against certain types of infections. Side effects however can be pretty severe including a lot of pain and nausea for a few days post-treatment. We went ahead with the cold season coming up as we didn’t want a repeat of what happened this summer accidentally. The first day after the treatment (~8 hour infusion) Noah seemed fine but the next two days he looked and felt pretty rough. During those days he had to come home with IV fluids so he couldn’t move around much. He had a slight fever the second day so they kept him attached to the IV fluids for another day. By then he was feeling better and wanting to jump around again like a normal 2-year old. Unfortunately he bent and pulled the needle out of his port that his IV was connected to and we couldn’t flush it properly. 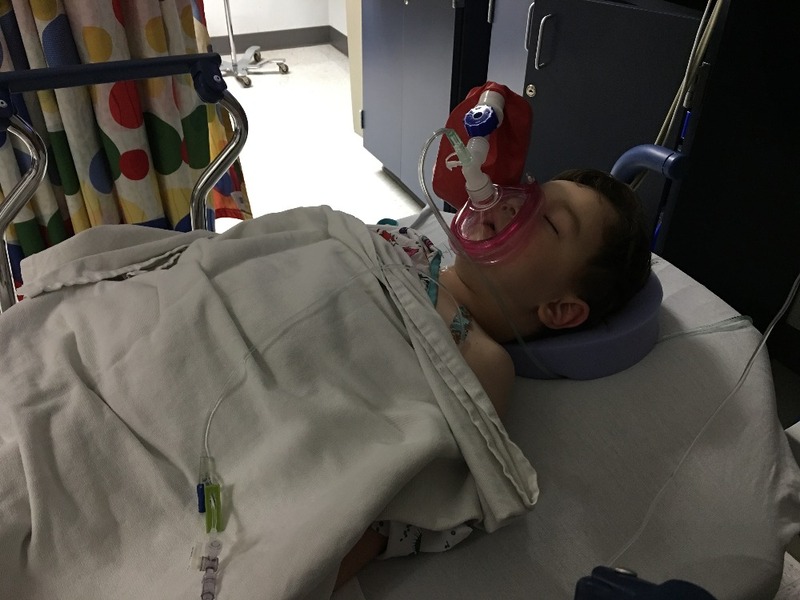 This led to another chain of events… While at the doctor the next day, they were working to flush his portacath and his line (catheter) blew out up in the vein that carries it down hear his heart. While not a major issue in itself, it did require Noah to have surgery to replace his portacath and catheter. This was probably not a bad thing in the long-run since he has grown so much and it might have needed to be replaced either way eventually with a unit that had a longer catheter. He’ll have to have this port for several more years at least and there is a lot of growing to do yet. The surgery was the other week and everything went smooth so nothing to worry about there. His scars are healed up and he didn’t seem to care about them much even a few days after. That is about it for the medical side of things. Besides all of that Noah had a blast this year on Halloween. He dressed up in a really nice astronaut outfit and did some trick-or-treating with his Mom and Grandma, but his favorite part was handing out the candy believe it or not. He wanted to stand by the door and see all the “monsters coming” and then open and give out some candy. He was pretty good at it too I might add. I also noticed that the last set of pictures don’t really show off his crazy curly hair so take a look below. We don’t know exactly where this came from but everyone seems to love it and we don’t know what to do with it so we’ve just left it alone for now. We’ll let him enjoy it for a bit since we’re not sure what will happen. That’s about it for now. Noah seems really excited for Christmas this year now that he knows what’s going on, so it should be fun. We’ll post another update either during or right after the holidays. If not before then, have a great Thanksgiving, a very Merry Christmas and a Happy New Year! For several months now not much has changed in terms of Noah’s condition aside from minor tweaks in his therapy, which is what we want. These past 1-2 months have been a little different however. Shortly after the last update, about mid-April, Noah woke up one morning with some severe swelling and pain in one of his testicles. The moment he woke up he was immediately complaining, refused to walk and kept telling us that something hurt. The swelling and discoloration was clear and we immediately took him to the clinic. The thought was that he could have a hernia and I believe this is what his doctor was hoping it would be. After a day full of x-rays and ultrasounds this was ruled out. 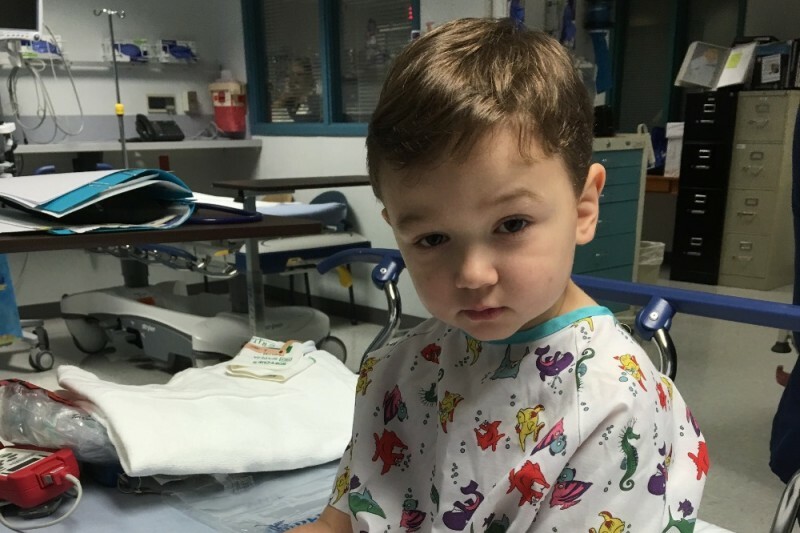 The main concern here was that Noah could be potentially relapsing with symptoms resembling testicular relapse which is a know occurrence in children with childhood acute lymphoblastic leukemia. His doctors also started noticing some significant changes (drops) in his granulocyte count and elevated liver enzymes. It was clear that something was going on but not 100% what. His blood itself didn’t show any specific signs so the decision was made to keep an eye on him closely for a few days and see what happened (swelling, pain, counts, etc). After 1-2 days the swelling was gone and Noah was bouncing around as usual but about a week later the swelling came back, this time for less than a day. No signs of swelling since. We’re still not sure what caused the swelling/pain but we’ll just have to keep a close eye on him for a while. He seems to be feeling great however and is learning countless new things every day. He is talking in complete sentences most of the time and running circles around us, so we’re not too worried. If anything changes I’ll be sure to update everyone here but it’s simply back to his regularly scheduled treatments with some minor adjustments to his chemotherapy. Not much has changed over the past few months, which is a good thing! Noah is still in the early stages of his maintenance therapy but we’re finally getting used to the schedule: 1 week of steroids followed by 3 weeks of various chemotherapy treatments with a spinal tap/lumbar puncture every other month or so. He is taking it very well and rarely seems to be affected by the drugs so we’re very happy about that. His doctor mentioned to us the other day that in a few more months he will be able to be around more people on a regular basis. We’ll still have to be careful but he won’t have to be quite so isolated like he is now. We just have to wait for the rest of the flu season to pass…can’t wait! Noah has had a lot going on outside of his treatments in the past few months and he did made it onto the news for the second time. Click here to see him having a blast at the Little Heros Prom earlier this month. Keep an eye out for the little guy in a Captain America outfit showing off some moves. We hope that everyone had a very Merry Christmas, New Years or anything else you might celebrate 🙂 We certainly did and it was good to have Noah at home this time (last year he was admitted right after Christmas before his birthday and New Years). 2012 was a bit of a rough year as you might have guessed but we made it through what seemed to be the tough parts and now Noah has officially transitioned into the “maintenance therapy” portion of his treatment. This is very exciting as he is making slow but steady progress, however there is still a long road ahead. During his maintenance phase he will still be on a considerable amount of medication and still has to see his doctor at least 3 days per week but the schedule itself is a little more consistent. One week of chemo at the clinic plus a regiment of steroids, then various chemo at home for 3 weeks, rinse and repeat. Plus the occasional spinal to make sure everything there looks good. We’ve been doing this now for about six weeks and getting the hang of it. Noah may end up puffing/swelling back up a bit for a long period due to the steroids but we can’t do anything about that unfortunately. We had a small scare during the holidays after Noah had been around a few too many people. He caught something and very quickly came down with a very dangerous fever for him, spiking up to almost 103 (they usually admit kids on chemo like this at 100.5), but his doctor was able to get it under control pretty quickly after some antibiotics and fluids at the clinic right after we noticed…phew! Other than that he has been really good and a happy camper as usual. In early December Noah attended the Kory Kubecka Santa Run breakfast which is a wonderful fundraiser in memory of one of his doctors former patients. There he received several gifts that he really wanted and got to be with Santa on stage. Noah ended up in several clips on the news and I was hoping to post the video here but the news website took it down for some reason. I’ll track it down somehow and post it later as soon as I find it. Noah also had a great 2nd birthday this year. When he spiked that high fever we thought me might end up in the hospital for his second birthday in a row but luckily that didn’t happen. He was practicing blowing out candles in preparation (video below) and his mom baked him a homemade banana and chocolate chip cake which he and everyone else loved. I’ll check in after a few weeks and post another update and of course some more pictures. There probably won’t be much to report, but no news is good news most of the time. Thanks for continuing to check in! Well it’s been quite a while since the last update…a lot has been going on. I had mentioned that Noah was almost done with his consolidation therapy but not as close as we thought. He has been on constant chemotherapy since then both at home and some high-dose treatments in the clinic without a break. His blood counts overall were high enough so his doctor just moved forward with his treatment without a break to stay agressive against the cancer. He got to enjoy Halloween and had a great costume that his Grandma and Zahra pieced together. Can you guess? Woody from Toy Story (see the pictures below). What’s next? Noah just finished up a long regiment of chemotherapy at home and will get a few days off this week and will be straight back to the clinic all week next week for more high-dose treatment. If everything goes well for a few more weeks I believe he will be moving into the next phase which is a still a lot of chemo but spread out every other week. I’ll make sure we post some more regular updates here for everyone. Noah is doing very well though and thank you for continuing to check in on him and as always, thank you for the ongoing support!